Middle West is located in the Northern Channel Islands, within the Channel Islands National Marine Sanctuary, on Anacapa Island. This site is located in an Area of Special Biological Significance (Santa Barbara Island and Anacapa Island ASBS) within the Anacapa Island State Marine Reserve in Channel Islands National Park, and is near the Anacapa Island Mussel Watch site. Deep surge channels separate this site from Middle East, and what little landing occurs at Middle Island occurs at Middle West. The site is typicaly lower and has more relief than Middle East. Middle West is dominated by consolidated volcanic bedrock, and the area surrounding the site is comprised of consolidated bedrock. The primary coastal orientation of this site is north. 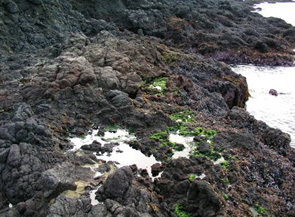 Long-Term Monitoring Surveys at Middle West were established in 1982, and are done by Channel Islands National Park. Long-Term MARINe surveys currently target the following species: Chthamalus/Balanus (Acorn Barnacles), Mytilus (California Mussel), Silvetia (Golden Rockweed), and Endocladia (Turfweed). In addition, motile invertebrates, mussel size structure, and water temperature are monitored at this site. Click here to view Long-Term trends at this site. Biodiversity Surveys were done by University of California Santa Cruz in 2001, 2005, 2012, and 2018. The Biodiversity Survey grid encompasses one section that is approximately 29 meters (along shore) x 10 meters (seaward). Click here to view Biodiversity Survey findings at this site. For more information about Middle West, please contact Stephen Whitaker.